Jackie & Canton Village Quilt Works!! A bit about Jackie & her shop! I have been a professional long arm quilter since 2000 and recently opened an online fabric shop in 2009! Frequently, you can find me blogging, filling orders, and quilting customer quilts. I have a very active blog and post 3-4 times weekly. You also can find me on Facebook. I also have a monthly podcast featuring great information and tips on quilting as well as "celebrity" interviews. The podcast is called Jackie's Quilting Chronicles. There is a link to it from my website, blog, and it can also be found in iTunes. My shop carries Westminster Fabrics, Kona Cotton Solids, 1930s reproductions, Australian Aboriginals, Batiks and more! Jackie has 3 prizes to offer to you!!! 3 prizes = 3 winners!! & a $20 gift certificate to Canton Village Quilt Works!! leave a comment saying which prize would be your first choice. You have till 10PM EST on Wednesday the 20th to enter! who also said "I would love the garden fabrics"
I love your shop and would love to be a part of the giveaway..
My first selection if I were a winner would be Jill Gordon's Cottage Garden fabrics from Free Spirit. But I would truly be happy with any of the three selections! 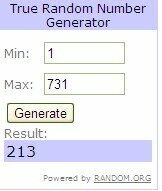 Thanks for hosting such a great giveaway. Stray Stitches has won a $20 gift certificate to Canton Village Quilt Works!! Thank You to all who entered!! I'd pick Jill Gordon's fabrics. I love the bright colors. I am now a follower of Canton Village blog. It looks like a fun one to read. I already follow Jackie's blog...LOVE it!! I am loving the Aunt Grace Authentic 1930s Charm Pack. I would love to make something from that! 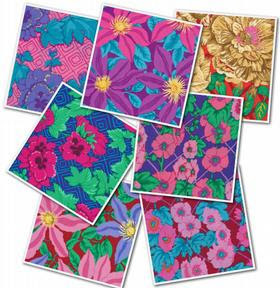 What I would choose first-no brainer- Kaffe Fassett Fabric-I'd jump up and down for joy!!! I have subscribed to the monthly newsletter. I am looking forward to receiving it. I am a follower of Canton Village!!! I'd be nuts not to want to look at all those beautiful fabrics. I know you must be nuts by now approving all these comments!!! I will be posting to my blog asap about the giveaway too. #1 ~ I've been contemplating buying some batiks for awhile now so with that being said I'd definitely pick the batiks if I had the choice. #2 ~ Signed up to be a follower! 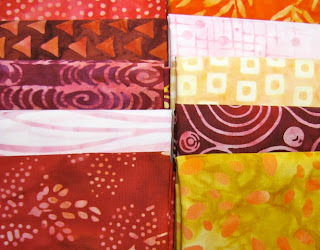 I would pick the Artisan Batik Bundle from Robert Kaufman - the colors remind me of fall!! #3 ~ Totally digging the Kona Poseidon Fat Quarter bundle! I already receive the shop's newsletter!! #4 ~ Signed up for her newsletter! I would choose the artisan bundle. Love the colors. I love gift certificate! Great giveaway! Thanks! I am a subscriber to Jackie's blog. I'm already a follower of Canton village! My favorite is Kaffe Fassett's fabric-Lake Bloom in Black. Love Jackie's shop...have been there many times and ordered many goodies. I would probably pick the gift certificate if I won...need some Kaufmann solids and covet the Kaffe fabric. Thanks to both of you for the giveaway. I love Wild Coconut in Black in the Australian Aboriginals. My favorite pattern is "big star flower"! It looks gorgeous, and easy enough for me to do! I am already a follower of Jackie's blog. They're all so pretty but I think my first choice of the prizes would be the Artisan bundle! #1: My choice would be the gift certificate--especially when solids go on sale for an unbelievably low price! I have been a follower of her blog for a long time now. She really does amazing things! MY favorite is Kaffe Fassett's aboriginal dots--I just bought some! definitely receiving the shop newsletter--you really need to if you're going to catch all the hot sales! I'm here because I follow Jackie's blog. I would pick the Artisan Batik bundle. The barbed-rail fence pattern looks intriguing. I've always wanted to do a rail fence and this adds a lot of interest to it. I'm following Jackie's blog with pleasure! I'm in a fall kinda mood today, so i would choose the bundle from Robert kaufman. Thanks! I am a follower of Canton Village!!! I'm a new follower to her blog. Just signed up for Jackie's monthly newsletter. Looking forward to finding inspiration from her in my mailbox! I love the Artisan Batik bundle. Those are so my colors. Signed up for Canton Village newsletter....went back a ways and looked at her older info/posts, etc. She's a great writer. And, I blogged about the giveaway. i am a follower of canton village!! I would love to have the cottage garden fabrics!! Fav Pattern has got to be Candy Queen, and not just because halloween is coming and Candy is on my mind and in my house to tempt me, the colours are vibrant, stunning and really calming as well. i signed up for the newsletter too!! i am a follower of Canton Village Quiltworks blog. My favorite fabric would be Aunt Grace Authentic fabrics and the pattern is Mod Quads. It would put a smile on my face if your giveaway found its way to my mailbox. i am loving the erin mcmorris weekends half yard pack! !it is gorgeous!! She has a great shop. Glad to have found it. My favorite would have to Kaffe Fassett Collective, jelly roll. Step 5 completed -- I posted the giveaway on facebook! The Cottage Garden Prints are Beautiful! All signed up for her newsletter. I would love the gift certificate. I would say my favorite is the Kona Solid - Amber - I love it! I opened up the Newly Arrived at Canton Village and instantly fell in love with the Aboriginal Dots. I love them! In all the colors! I also signed up for the newsletter. Jackie's shop is wonderful! I love those Artisan Batiks. I would select the Artisan Batik Bundle from Robert Kaufman Fabrics ... so pretty! It was impossible for me to decide between the two fabric choices. I'd just be tickled to win either or the gift certificate. Thanks! I'm already a follower. Thanks! #1: I would LOVE that gift certificate! Turn me loose on their site!! That could get dangerous for my hubby! My favorite fabric would be anything Kaffe Fassett. I love all the kona cotton solids...I would have to stock up with the gift certificate! I'm already subscribed to the newsletter. Thanks for the giveaway! I love her selection of Kona solids! #2: I am already a follower. I must say it's a pretty cute blog! I already receive Jackie's newsletter. I already follow Jackie's blog ... wouldnt miss it! I already get Jackie's newsletter - look forward to it :)!! #3 I'm loving that Gypsy Rose collection in the fabric shop! I love the first batch of fabrics...just my colors. I have been a follower of CV for a long time. I am already a subscriber to the newsletter. Jackie's patterns are wonderful, but I would have to go with the Mod Squares one myself. The Fourth of July is fabulous too. ooh I'd love the Jill Gordon Cottage Garden fabrics. Thanks for the chance to win! I am already a follower of the Canton Village blog. I'm a follower of CV! I love the fabrics! But there is so much wonderful stuff in her online store, I'm going to have to say my first choice would be to win the gift card! There are so many wonderful fabrics and patterns....but I think the Sugar Fat Quarter Bundle looks amazing!!! I'd love the batik bundle. Gorgeous. I signed up for the Canton Village Quiltworks Newsletter. Thanks! I am a follower at canton village's blog! I love the pattern all together now! So great! Fun! If I won I would like the batiks. They are beautiful! I now follow them on Facebook. I am really liking the batik fabrics. Great colors. I'm in Love with the All Together Now quilt. It was so fast and easy to make and the colors are stunning and Fun!! I was already a follower of Jackie's blog. I already get Jackie's newsletter and have been for a while. I would love to win the Artisan Batik Bundle. I'm a total bag lady, so my favorite pattern is "Nicole's Bag"
I just signed up for your newsletter. I didn't know you had one, so thanks for letting us know. I love the Robert Kaufman bundle! Colors good enough to eat!! Hi ! I like the Clematis ( red and green both !) from Canton Village Works !!!! 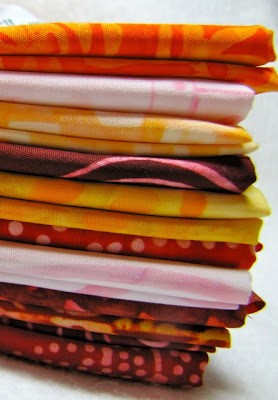 I would choose the An Artisan Batik Bundle from Robert Kaufman Fabrics! Would love to win this!! 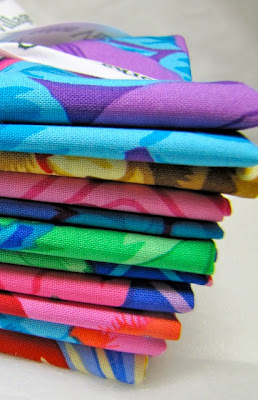 I would love a batik bundle, such beautiful colors. I am a follower of Jackie's blog. PS - I like your new logo! As usual, I'm depending on this one entry to do it for me. *S* I have ordered from Jackie many times. She is the master of a packaging presentation. I follow canton village quilt works blog. I signed up for the newsletter ! I would love the gift card, she has come fantastic Kona Solids I'd love to get my hands on! I love the dots and loops gold from weekends. My first choice would be the Robert Kaufman fabrics. They are gorgeous. I'm a follower of her blog! I really like those Aboriginal dots she has in the new section. I am a follower of her newsletter. Would love the gift certificate! I want at least one of each of Jackie's gorgeous jelly rolls. I would love the bright colors of Jill Gordon's Cottage Garden fabrics from Free Spirit. I am a follower of their blog. I just signed up for the email newsletter. I would choose the gift certificate and purchase some Kona solids! But who am I kidding? I would be ecstatic to win any of the 3 items! I love the colors in Jill Gordon's Cottage Garden fabrics from Free Spirit - so that would be my first choice. Thanks for the chance to win! I am a follower of canton village quilt works blog. I love the pattern 4th of July by Judy Neimeyer. I like the artian batik bundle. I'd choose the Artisan Batiks! I am a follower of the Canton Village blog. I have been a follower of Jackie's for quite a while now! I would love to win the bundle of Jill Gordon's Cottage Garden fabrics from Free Spirit. It is so lovely and bright. Jackie is a wonderful person! Always so helpful in any questions you have when ordering and always very concerned! I already signed up for Jackie's newsletter a few months ago. ALways happy to receive it! I see that she carries the Essex cotton/linen blend solids. I'd really like to give them a try as sashing. I think they would add textural interest. So I guess my favorite fabric is Essex cotton/linen in sand. My first choice would be the Free Spirit fabrics. I am a Canton Village Quilt blog follower. I really like this fabric:Fruity Scoops by Art Gallery on the Canton Village site. I am signed up to get the newsletter. I posted about the giveaway on facebook. Difficult decision to make, which fabric or pattern I'd choose. I think I would go for the Log Cabin Shuffle. That should be a great challenge! I am already a follower of Canton Village Quiltworks. I'D CHOOSE THE R.KAUFMAN FABRICS. Whew! I'm really liking the Jill Gordon fabric! I love the fabrics from Lunn Studios. I am REALLY liking the Batik Elemental dots she is carrying these days! ESPECIALLY the Flame! What a hard choice!! I'm gonna say the Jill Gordon's. Thanks for the opportunity to win! I would love to win the Artisan Batik Bundle - gorgeous fabric! Thanks for the chance for an awesome giveaway!! I would pick the Kaufman batiks. I am a follower of Canton Village Quilt Works. 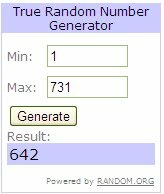 Thanks for an incredible giveaway.